News and notes from Marilee Brothers... Send in a photo and you could win! Happy spring! I can't believe it's been four months since I've scraped together a newsletter. The picture (right) features my good friend, Pat Sugden, reading a copy of Moon Rise. Her picture gave me a big old brain blast. How cool would it be if a bunch of you sent in pictures of yourselves, your loved ones, your cats, dogs and/or birds reading my books. Yes, that's right. I want pictures. Lots of pictures. One lucky person (maybe more) will receive a signed copy of Midnight Moon, the last in the Unbidden Magic series, when it comes out next fall. So, get busy. Pull out that copy of Moonstone, Moon Rise, Moon Spun or Shadow Moon and snap a picture of somebody, or something, reading it. When you're ready to upload it, go to my website and click on the link at the top of my home page. Who knows? You could get lucky! Writing Midnight Moon (now 40,000 words) Answering emails. Attempting to stay active on Facebook and Twitter. Updating my blog, Book Blather, twice a week. Attending author fairs in the Pacific Northwest. Reading a ton of books. Hacking my way around the golf course. Mahjong. Planting my square-foot garden. Fishing. Watching granddaughters play soccer. Eating too much. What about you? Use my Contact Form to let me know. Say what? 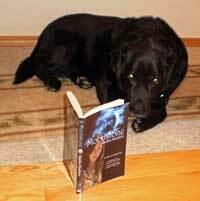 You didn't think dogs could read? Now, I ask you, how could I possibly be a muse if I couldn't read? So, yes, that's me reading one of the books I helped write. Here's how I helped. I planted my large furry self directly behind Marilee's chair and refused to budge until she had her word count done for the day. Then, I allowed her to have a small treat. She likes things like Cheese Doodles and tuna sandwiches. I do too. Fortunately, she shares. (Yawn) All that reading made me tired. Must be naptime. Mauli the Muse, signing off. Follow Marilee on Facebook, www.facebook.com/marilee.author. On Twitter, www.twitter.com @MarileeB, at www.goodreads.com and please follow her book blog, Book Blather, at http://bookblatherblog.blogspot.com.